Don't read this blog. Read this article. Sorry for the lack of blogging yesterday. True fact - I was unexpectedly late and excessively wine sloshed from attending the book launch dinner for my husband's former colleague's new book on Russian withdrawal from Afghanistan. Yes, I live exactly the life that the populist right imagine I do. But you shouldn't be reading my blog anyway - instead, if you haven't already, you should be reading Ryan Lizza's fascinating article taking a close look at the Obama administration's foreign policy. The piece isn't hagiographic towards the President, nor is it pointlessly critical - just an honest attempt to understand the different forces within the administration and how Obama himself is evolving as a foreign policy thinker. But the Afghanistan decision, like all government work, was driven by politics and ideology. Obama’s eagerness to keep his campaign promise, the military’s view that reducing troops meant a loss of face, Clinton’s decision to align with Gates, and Holbrooke’s inability to influence the White House staff all ultimately conspired to push Obama toward the surge. OK. But wouldn't another way of putting it be to say that Obama had been persuaded by the need for a surge during the campaign (presumably that's why he made that promise, yes?) and the onus was now on the advisors who disagreed to prove their case. Hillary Clinton seems to have aligned herself with Gates because she agreed with him about a lot of policies, not just to bolster her position - although it may have had that effect. And the article then goes on to show that she had no compuction about strongly disagreeing with Gates later on in calling for Libyan intervention. And as for Holbrooke - another way of saying "inability to influence White House staff" would be "failure to persuade." Anyway, the article sketches a fascinating fresh portrait of the age-old cross-party dispute between foreign policy realists and interventionists, and makes the case that Obama doesn't align with either party but focusses more on a situation-specific analysis of the plausible outcomes in each case. Lizza calls him "The Consequentialist". 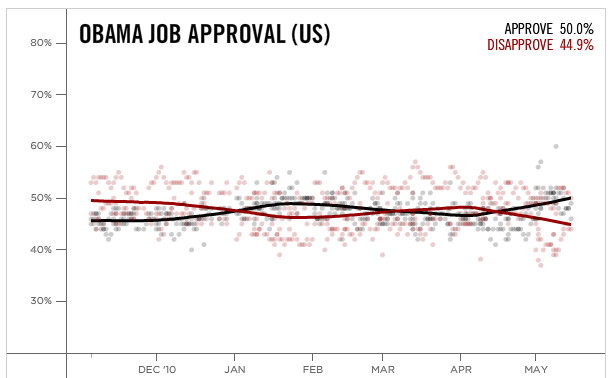 This graph tracks the President's approval rating over the past 6 months. 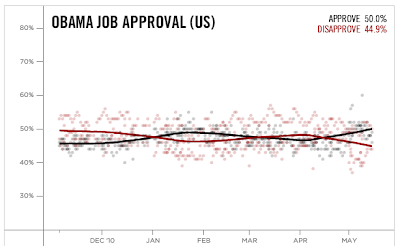 Whenever the black is over the red line, that means more people approve than disapprove of Barack's job performance. That first little peak in January shows the nation clearly rallying behind him as consoler in chief after the Gabrielle Giffords shooting. The most recent spike began just after the death of Osama Bin Laden. In both cases, I find it interesting that the President's displayed great sensitiviy and excellence at a key aspect of his job more or less exactly corresponding with the Republicans putting on a freak show of unseriousness. In January, Sarah Palin responded to the Giffords shooting as if she herself were the real victom, and of course Donald Trump walked right into Obama's carefully laid trap just in time for him to spring it on him at the White House Correspondence Dinner mere days before the death of Bin Laden. Will this improvement in the polls last? I'm going to go out on a limb and make a prediction that it will - that at least the black line will stay over the red for the next couple of months. It's probably foolish for me to actually put that in writing, though. After all, as the great Yogi Berra used to say, "It's tough to make predictions. Especially about the future." RIP Tim Hetherington. A brave man in every meaningful sense. I feel a bit haunted today. They say all things are connected - certainly all things in the Internet are. The trivial and the profound mushed together into a sometimes nutritious, sometimes nauseating stew. I was reminded of this today by the apparently innocuous act of reviewing my blog stats. You see, this blog received a big-for-me spike of visits on April 20th - with just over 4,000 people visiting on a day when I hadn't actually posted anything and wasn't really paying attention. It was only today that, out of interest, I dug in a litttle bit deeper and managed to find the source of most of my visits on that particular day. It was this. The Twitter stream of photographer, journalist and filmmaker Tim Hetherington. Renowned for his work in dangerous parts of Africa, Tim had been nominated for a 2011 Academy Award for a documentary he had made about his time in Afghanistan. Tim hadn't been using Twitter much recently, which is why just three tweets down on his page you can see him retweeting my infamous Sarah Palin blog back in January. Then on February 28, he talks about attending the Oscars and links to a snapshot from the night. On April 19th, he wrote: "In besieged Libyan city of Misrata. Indiscriminate shelling by Qaddafi forces. No sign of NATO." On April 20th, he was killed by enemy fire in Libya while travelling with anti-Quaddafi forces. Soldiers, and other men and women who serve on the front lines of conflicts are routinely described as "brave" when going into battle or, more poignantly, when they don't make it home from battle. Personally, I always think of "bravery" as two separate things. The first is physical courage - the willingness to put yourself in danger irrespective of cost. Soldiers, firefighters and police certainly demonstrate such bravery on many occassions but so can terrorists, murderers and criminals. A frequently useful but not inherently noble attribute. The second type of bravery doesn't necessarily require physical courage - and that's the strength to do things the hard way because it's the right way. To consider not just your own point of view but what you might learn from those unlike you. To shut up and listen instead of claiming glory to yourself. To turn something painful, complicated and emotionally draining into art. Tim Hetherington seems to have combined beautifully these two different types of bravery in the person of a man I would have liked to have know. Please take a moment to appreciate his work. So I couldn't be bothered to write about Donald Trump's ridiculous "Presidential Campaign", and now I don't have to! Hurray! If only the other chores that I dread could be dealt with so efficiently. My laundry doesn't seem to get done if I ignore it, the dishes keep sitting in the sink until I wash them, and as for the floors - well, our hoover stubbornly refuses to be self sufficient. But it turns out, if I ignore Donald Trump, he will in fact go away. Good to know. Just about three months to the day since he jumped into the presidential fray with his surprise appearance at CPAC, Donald Trump put an end to his crash course through the presidential field by pulling out of the race before he ever officially got in. Bye bye Donald. Thanks for stopping by. It's been.. interesting. Here's your hat, what's your hurry? Ok, buh bye now. Bye. Off you got. I'm shutting the door. Goodnight. The President Could Lose. But Can Any of these Republicans Win? In 2012 it's not just Barack Obama who will be up for election, but the very notion that hard work, discipline, careful management and a refusal to condescend to the easy or superficial path can beat cynicism, glibness, unseriousness in matters of policy and the notion that politics is just reality TV for the elites. These are serious times and our President is a serious man. Don't let his big smile, his deft way with a joke, and his willingness to go on Oprah fool you - Barack Obama is an unusual determined, evidence-based and serious minded President. I'm not going to rehearse today the many institutional constraints and structural problems President Obama personally and the Democratic Party generally faced over the past two years. 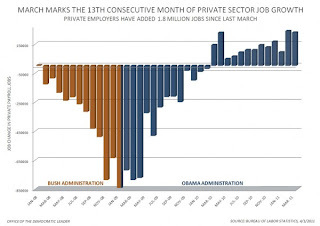 I'm not going to try and excuse any perceived or real failures of the administration. Today, I want you to think about the alternatives. I'm under no illusions about this - President Obama faces a tough reelection fight in 2012. He will - rightly - be asked to defend his record and to make the case for why, where progress has been slow, he should be given the chance to keep trying. So the President could lose. And, if he can't make a clear and compelling case for his record, he'll deserve to. But... for the President to lose, a Republican would have to win. And the Republican party has been startlingly slow to kick start their Presidential race. You may recal that at this time in 2007, there was already a hot election underway in the respective primary cycles for both parties, with Republican candidates including AZ Senator John McCain, former WI Governor and Cabinet Secretary Tommy Thompson, former VA Governor Jim Gilmore, KS Senator Sam Brownback, former MA Governor Mitt Romney, TX Representative Ron Paul, Former AS Governor Mike Huckabee, former NY Mayor Rudy Guiliani, CO Representative Tom Tancredo and CA Represenative Duncan Hunter. There were also a range of joke or outsider candidates, but let's leave them aside for now. Until yesterday, it looked like former Arkansas Governor Mike Huckabee would be among this list, but he has since announced that he will not be seeking election this year. I feel I would be remiss as a blogger, though, if I didn't nevertheless give you the chance to enjoy his latest commercial project - aimed at teaching American History to kids who have been indoctrinated cruelly with the dangerous liberal curriculum. "Some of their morals are just GONE!" "Oh no, it's bad. Really bad." So the invaluable Nate Silver has done a detailed analysis of the primary election prospects of a very wide range of prospective Republican candidates. In almost all of his analyses, the candidate who comes out as most likely to win the nomination is the former Massachusetts Governor Mitt Romney. Now, Mitt's a pretty decent guy as Republicans go. His signature achievement in Massachusetts was to pass a bipartisan health care law that mandates that all citizens in the Bay State should have converage. This program has proved so successuful that Massachusetts now has the lowest rates of uninsured citizens in the country - and it has maintained its position as the state that delivers some of the best health care in the country. And, frankly, as I have said before, it's a great place to live in a lot of other ways too. But... well.. how shall I put this? If you want to vote for a candidate who believes in a pragmatic solution to our health care crisis, there's ANOTHER CANDIDATE on the ballot who has a lot of experience with the Presidency. I'm personally kind of loving how the President's team have been spending their energy conspicuously congratulating Mitt on his health care reform right left and center. And this ad produced by the Massachusetts DNC just cracks me up with it's not-so-secret evil plan. Mitt is, ironically, going to have a hard time still convincing his party that they should enthusiastically support a candidate who himself enthusiastically supported the Heritage-Foundation-drafted, compromise health care proposal that later came to look dangerously like the one that the President and Congressional Democrats passed. I'm still mulling this, trying to work out which of these people makes for the most credible opponent. I'm struggling. What do you think, my blog amigos? 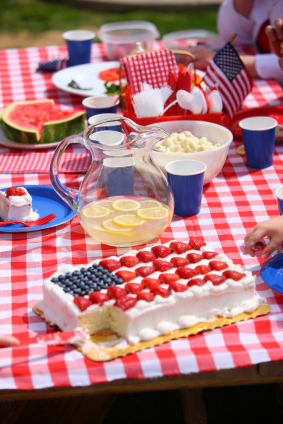 In summer, you'll spot us looking for red, white and blue bunting, or illegal fireworks, or inventing desperately patriotic desserts. One year I made an American flag out of raisins and blueberries in creme anglais. The point is, some of us - even some who don't normally associate with our fellow expats the rest of the year - get a little homesick. The reason I bring thus up is that tonight I sat in on an organising meeting for our Democrats Abroad July 4th celebration. And I'm so excited I can hardly stand it. We've got kids games, decorations, speeches, voter registration, balloons and - if we get the same turnout as last year - about 1200 fellow Americans to party with. And the whole thing happens in a beautiful central London park square that is normally off limits to the public. So if you live in the UK, mark the date of July 3 in you diary and make sure to join Democrats Abroad so you'll get all the info by email.